UPDATE 8 April: Club Balonmano Gesatur (ESP) has replaced CBMP Ciudad de Málaga (ESP) in the women's event, group B. 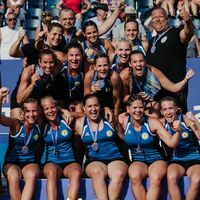 The European Handball Federation has confirmed the 28 teams participating at the European Beach Handball Tour Finals 2019 which will take place from 6 to 9 June in Baia Mare, Romania. 14 teams each in the men’s and the women’s event, divided into two groups of seven, will take the courts including last year’s ebt Finals winners, women’s team Multichem-Szentendrei N.K.E. from Hungary and men’s champions Pinturas Andalucía BM Playa Sevilla from Spain. Following the preliminary round, a knockout phase with quarter-finals, semi-finals and finals will decide the eventual winners.